For other uses, see Tallow (disambiguation). Tallow is a rendered form of beef or mutton fat, and is primarily made up of triglycerides. It is solid at room temperature. Unlike suet, tallow can be stored for extended periods without the need for refrigeration to prevent decomposition, provided it is kept in an airtight container to prevent oxidation. In industry, tallow is not strictly defined as beef or mutton fat. In this context, tallow is animal fat that conforms to certain technical criteria, including its melting point. Commercial tallow commonly contains fat derived from other animals, such as lard from pigs, or even from plant sources. Tallow consists mainly of triglycerides (fat), whose major constituents are derived from stearic and oleic acids. The adjacent diagram shows the chemical structure of a typical triglyceride molecule. Greaves (also graves) is a byproduct of the rendering process, used in making animal feeds. See also the History of dog food. In Leviticus 3:14-17, the Israelites are forbidden to eat the suet surrounding certain internal organs of animals (e.g. cattle and sheep) sacrificed at the Temple. This suet is Halakhically called chelev. English Bible translations sometimes translate chelev to "tallow", although the original text only forbids tallow from species offered for sacrifice; tallow from other (typically wild) kosher quadrupeds (e.g., deer) is not forbidden. Tallow is used mainly in producing soap and animal feed. Some polymer banknotes contain beef tallow. Many items of traditional goods are produced from tallow, which was widely available domestically. Tallow can also be used as flux for soldering. It is also the primary ingredient in some leather conditioners. Tallow used to be used commonly in high-end shaving soaps, in particular those of elite British firms such as Geo. F Trumper, Truefitt & Hill, and Taylor of Old Bond Street. While these firms have reformulated to a vegetable base, tallow-based shaving soaps have enjoyed a resurgence in recent years with the gaining popularity of traditional wet-shaving. Makers exist in Turkey, Italy, and the United States, including artisanal brands Williams and Nod Hill. A significant use of tallow is for the production of shortening and is one of the main ingredients of the Native American food pemmican. Tallow is traditionally used in deep frying and preferred for this use until the introduction of other oils. Before switching to pure vegetable oil in 1990, the McDonald's corporation cooked its French fries in a mixture of 93% beef tallow and 7% cottonseed oil. According to a 1985 article in the New York Times, tallow was also used for frying at Burger King, Wendy's, Hardee's, Arby's, Dairy Queen, Popeyes, and Bob's Big Boy. Greaves (also graves) is a byproduct of the rendering process, used in making animal feeds. Historically it was both favored and shunned in dog food, but today is widely found in both wet and dry commercial feeds. Tallow can be used for the production of biodiesel in much the same way as oils from plants are currently used. Because tallow is derived from animal by-products, which have little to no value to commercial food industries, it avoids some of the food vs fuel debate. The United States Air Force has experimented successfully with the use of beef tallow in aviation biofuels. During five days of flight testing from August 23 to 27, 2010, at Edwards Air Force Base, California, a U.S. Air Force C-17 Globemaster III flew using JP-8 conventional jet fuel in three of its engines and a 50/50 blend of JP-8 and HRJ biofuel made from beef tallow in one engine on August 23, followed by a flight with the same 50/50 blend in all four engines on August 24. On August 27, it flew using a blend of 50% JP-8, 25% HRJ, and 25% coal-based fuel made through the Fischer–Tropsch process, becoming the first United States Department of Defense aircraft to fly on such a blend and the first aircraft to operate from Edwards using a fuel derived from beef tallow. Tallow also has a use in printmaking, where it is combined with bitumen and applied to metal print plates to provide a resistance to acid etching. The use of trace amounts of tallow as an additive to the substrate used in polymer banknotes came to light in November 2016. Notes issued in 24 countries including Canada, Australia, and the United Kingdom were found to be affected, leading to objections from vegans and members of some religious communities. Tallow once was widely used to make molded candles before more convenient wax varieties became available—and for some time after since they continued to be a cheaper alternative. For those too poor even to avail themselves of homemade, molded tallow candles, the "tallow dip"—a strip of burning cloth in a saucer of tallow grease—was an accessible substitute. Early in the development of steam-driven piston engines, the hot vapors and liquids washed away most lubricants very quickly. 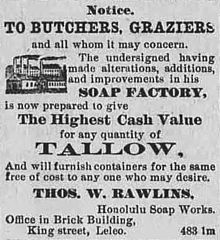 It was soon found that tallow was quite resistant to this washing. Tallow and compounds including tallow were widely used to lubricate locomotive and steamship engines at least until the 1950s. (During World War II, the vast fleets of steam-powered ships exhausted the supply, leading to the large-scale planting of rapeseed because rapeseed oil also resisted the washing effect.) Tallow is still used in the steel rolling industry to provide the required lubrication as the sheet steel is compressed through the steel rollers. There is a trend toward replacing tallow-based lubrication with synthetic oils in rolling applications for surface cleanliness reasons. The use of tallow or lard to lubricate rifles was the spark that started the Indian Mutiny of 1857. To load the new Pattern 1853 Enfield Rifle, the sepoys had to bite the cartridge open. It was believed that the paper cartridges that were standard issue with the rifle were greased with lard (pork fat), which was regarded as unclean by Muslims, or tallow (cow fat), which is incompatible with Hindu dietary laws. Tallow, along with beeswax, was also used in the lubricant for American Civil War ammunition used in the Springfield rifled musket. A combination of mutton tallow, paraffin wax and beeswax is still used as a patch or projectile lubricant in present-day black powder arms. Tallow is used to make a biodegradable motor oil by a Stamford, Connecticut–based company called Green Earth Technologies. Tallow finds a number of uses in woodworking. It can serve as a lubricant and rust inhibitor on tools such as saw blades and cast-iron plane bodies. It can also be helpful with screwing fixings into hardwoods, particularly when brass screws are employed. For this purpose, a mixture of about half tallow and half beeswax is best. The wax and tallow are melted over a low flame, mixed and allowed to cool and solidify. This reduces the risk of screw breakage during initial screw penetration and also eases later screw removal should this be required, by preventing corrosion. Historically, animal tallow has been used in salves and ointments against intertrigo and sore skin: pork (Latin Sevum porcinum), beef (S. bovinum), deer (S. cervinum, German Hirschtalg), goat (S. hircinum), and mutton (S. ovillum). ^ a b Greaves: a high-protein solid which is left following the extraction of tallow from animal by-products during the rendering process. ^ a b "The Sportsman's Dictionary; Or, The Gentleman's Companion: for Town and Country: Containing Full and Particular Instructions for Riding, Hunting, Fowling ... Hawking, &c. With the Various Methods to be Observed in Breeding and Dieting of Horses Both for the Road and Turf; Also, the Management of Dogs, Gamecocks, Dunghill-fowls, Turkies, Geese, Ducks, Pigeons, Singing-birds, &c. And the Manner of Curing Their Various Diseases and Accidents". G.G.J. and J. Robinson. 6 December 1785 – via Google Books. ^ Alfred Thomas (2002). "Fats and Fatty Oils". Ullmann's Encyclopedia of Industrial Chemistry. Ullmann's Encyclopedia of Industrial Chemistry. Weinheim: Wiley-VCH. doi:10.1002/14356007.a10_173. ISBN 3527306730. ^ "Mcdonald`s Turns To Vegetable Oil For French Fries". chicagotribune.com. ^ Irvin Molotsky (November 15, 1985). "Risk Seen in Saturated Fats Used in Fast Foods". nytimes.com. ^ Thamsiriroj (2011). "The impact of the life cycle analysis methodology on whether biodiesel produced from residues can meet the EU sustainability criteria for biofuel facilities constructed after 2017", Renewable Energy, 36, 50-63. ^ "C-17 Conducts Flight Test With Biofuel - Aero-News Network". www.aero-news.net. ^ "Why there is processed cow in Canada's money. Hint: you can blame it on the polymer". nationalpost.com. 30 November 2016. ^ Petroff, Alanna. "It's not just the U.K. These countries also have animal fat in their money". cnn.com. ^ "Cold rolling mill lubricant - US Patent 4891161". patentstorm.us. Archived from the original on 2007-09-29. Retrieved 2007-04-05. ^ Motavalli, Jim (5 February 2009). "Oil Goes 'Green,' with the Help of Some Cows". The New York Times.